I've been lacking in the knitting FOs department as my eyes have strayed elsewhere lately. I FINALLY pulled out my wonderful Ashford Knitter's Loom and finished the project that was warped and quickly warped another one. I've got something else on the loom now using some black microfiber and sari silk. 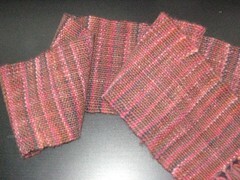 Weaving is such fun and as far as instant gratification goes, it's pretty darn great! I'm making steady progress on my Multnomah shawl. I've gotten to the feather and fan finally - almost 9 repeats in and working towards a total of 10. Off to knit and read for a bit (Sean bought me a Kindle for my birthday! )...hope everyone has a great Sunday! So, with this first really wonderful evening of porch-sitting, Sean has renewed his efforts to put power and cable and a TV bracket out on the porch so we can sit AND not miss our shows (or basketball, in the case of this week...). He's a flurry of activity right now because he's going to have to pull wires to make it all work. The thought of this evening being able to drink beer and watch b-ball is pretty cool though! 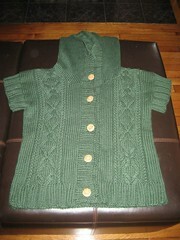 On the knitting front, I've been motoring along on my Liesl cardigan. 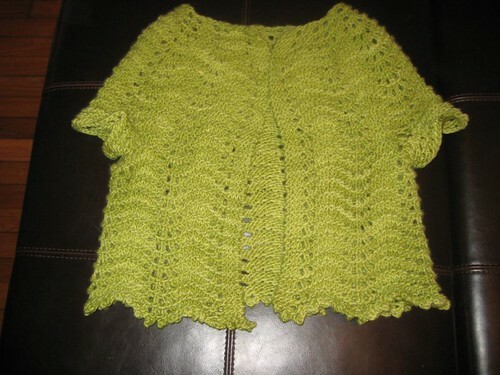 I love this pattern and I love the yarn I'm using - Malabrigo Worsted in Lettuce. I have to say, it will be the last green thing that I'm going to knit for awhile, even though Citron in Malabrigo lace is next in my queue. I just have to move away from green for a little bit. I'm still not sure how I ended up with this much in the first place!! Multnomah and I are having a tumultuous relationship. 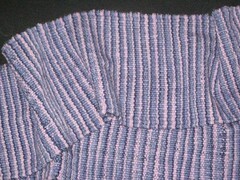 You would think that it being all garter stitch to the border that it would be fairly straightforward. Wrong! Give me feather & fan or cables any day - garter is making me sloppy. First I missed a yarn-over...15 rows back. Ugh. Tried to rip back just the few stitches and then up again with no luck - frogged all 15 rows. Then, this afternoon, I'm in the waiting room at the vet (no worries, Mir just needed blood-work for her thyroid condition) and I notice 9 rows back just the oddest looking stitch ever. Seriously - no clue what I was doing except I know that around then I was knitting at the movies while watching Green Zone. This time I successfully took the three messed up stitches down all 9 rows and knit them back up without losing the entire thing. I think I've got it now but really, I think I'm going to finish Liesl since that (knock on wood) has been a much smoother project. Next to be cast on are Calvin & Ripple socks by Cristi of Turtlegirl's Bloggy Thing. Might have to call them Mir & Gracie (and in memory of Georgie...) socks though because they're a bit jealous. I haven't grabbed needles for them but the yarn is all picked out (Cascade Heritage Paints). Cristi is SUPER DUPER thorough in her pattern instructions and while 11 pages for two socks is rather daunting, I'm ready for the challenge. I think that's it around here...oh, a quick update on Sean's sweater. Of course, the day that I picked it up from the tailor was the day the weather began to turn. Of course. We still had some rather cool mornings the next week though and Sean ended up wearing it as a jacket three days in a row and then out to dinner with some friends one evening. How cute is that? Sweater curse? I don't know nuthin' 'bout no sweater curse! Of course, I'd also highly recommend letting your significant other pick out the yarn and pattern and make him or her feel like they're part of the process right from the start. Well, off to drink my Magic Hat #9 (best beer EVER) and spray down our porch of all the pollen so that we can properly prepare for our TV-watching-on-the-porch-extravaganza this evening. Sorry for the no picture situation today...more hopefully coming soon! 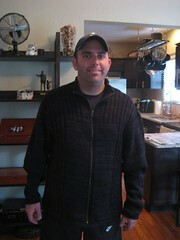 ...because Sean's sweater is finally finished!!!!! Never mind that the actual knitting was done in October. Or that the re-knitting of the collar and sewing together was done in December - the d#$% zipper is finally in! I was too scared to put the zipper in myself so I left it up to a tailor here in town who came highly recommended from one of my running partners. I brought it home from the tailor's this morning and he put it on immediately. I think he looks awfully handsome, in spite of the cap, the t-shirt, and, oh yes, the shorts he's wearing. Of course, the weather broke here in Florida today so it's over 70. I hear rumor that it might get chilly again later in the week so he might still have a chance to wear it once before the real heat sets in. That's the deal around here. I also finished a pair of No Purl Monkeys last week so I'm now using the leftovers to knit baby booties for three different folks either expecting or newly blessed. I've got Multnomah on the needles as well. I'm VERY excited about my two upcoming projects - a Liesl in some yummy Malabrigo worsted in Lettuce and a pair of Calvin & Ripple socks in an as-yet-to-be-determined colorway. Always something happening around here! 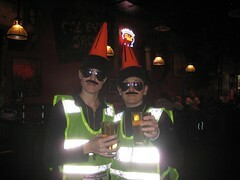 Last Saturday, my friend Courtney and I participated in the RubberNeck Race here in Orlando. Basically, it was an adventure race/scavenger hunt a la "The Amazing Race" - only one of my most FAVORITE shows in the world. We had a BLAST! The weather was atrocious for most of it but we made the best of a wet situation and just went for it. Jason and Sean hung back at the bar (start and finish line) with a computer so that they could feed us information as we needed it. That is completely within the rules of this type of racing! Here are "The unOfficials" enjoying a pre-race beverage...we later regretted this choice as we tried to run with full...ahem...bladders. The other dumb mistake of the day? Deciding that running 6 miles with our regular group that morning would be a good idea! 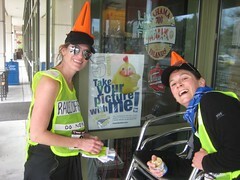 We found one of two duck posters while we raced - good for 5 minutes off our total race time! This was in the last 20 minutes of the race. We had heard just before that the first team had already come in. This was the location of the second-to-last clue. Almost there! Needless to say, we made it back in one piece and IN SECOND PLACE!!!!! The first place team had just about 20 minutes on us and other teams came in not too long after us. What does this get us? $300, a 2 night stay in Key West, and entry into the championship race at the end of April. Wahoo!!!! 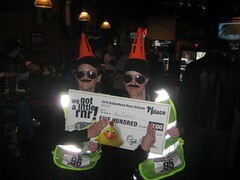 The first place finishers let us borrow their giant check for a picture...we improvised. Overall a fantastic day but boy were we tired. Ended up covering approximately 9 miles throughout the race. Add that to the 6 earlier that morning and I did more distance last weekend than I've done in over a year! Good times though...KEY WEST HERE WE COME! When Sean got home from work last night, he found her on the floor of my bathroom. She was already gone. That dear man intercepted me on the porch when I got home last night so he could tell me before I rushed into the guest room to put my work stuff down and said hello to the girls. He knows me well. He led me in to see her and I just sat there, rubbing her soft, furry head. Sean had already called my folks - who called to say they were on their way over. He had also called Mark who was already barreling down I4 to get to us. Once Mark got there, Mom, Dad, and Sean left us alone. We sat on either side of her and cried and pet and fussed over her. She has always been a daddy's girl but she and her sister, Gracie, were with me for a couple of weeks so that I could get some kitty love too. I knew something was up yesterday morning. George was sticking close to me, going so far as to sit on the shower mat while I took my shower. She seemed a bit out of sorts but I chalked it up to an upset tummy. After she got sick, I figured she'd be on the mend. I did take some extra time to snuggle her on the recliner before work. We had a good snuggle and she purred away! I reminded her how after work I was going to come and get her and Gracie to go back to Daddy's. Later on that morning, Dad checked on her when he came to pick Nittany up for the weekend. Dad texted me that she seemed fine and like her normal self so I didn't think anything of it until I arrived home. One look on Sean's face and I knew, I just knew. Oh sweet, sweet George, how I will miss you! You will always be my girl and Daddy's peanut! Sweet dreams, little girl! 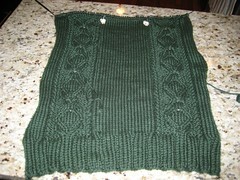 Well, I was thinking it's time to resurrect the blog...and what better time than the Knitting Olympics? There's lots of talk over on Ravelry about the Ravelympics and technically I've joined the "sweaterboard" event but I didn't actually join a team. I thought about joining one of the podcast teams but I listen to so many! 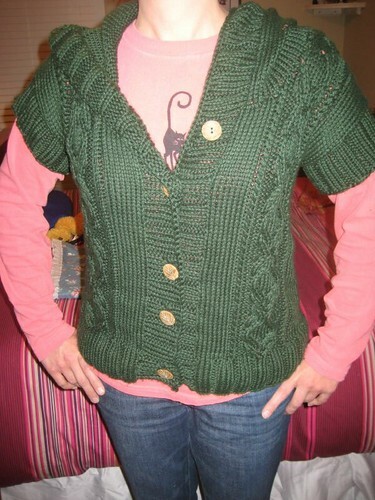 So, this morning, I was catching up on Yarn Harlot's blog and read about the Knitting Olympics. I remember reading about them the last time around...and figured, why not? So, I throw my hat in the ring...I will be casting on for the Heather Hoodie Vest (rav link) tomorrow night during the opening ceremonies. It's not my first sweater but definitely my first big project with cables...we'll see how it all goes! I'm very excited! It's a pattern that I've wanted to knit for awhile but I had other things on the needles that needed finishing (or almost finishing) first. In the meantime, I finished up a pair of socks for my mom which were supposed to be mine but I made the first foot more size 9.5 than 8 so, voila!, socks for Mom! I also finished 1/2 of a pair of "no purl monkeys" made out of Yarn Pirate's Daffodilly colorway. So cheery and fun! Also started a Multonomah but no pics yet. Everything gets put on hold tomorrow, though!